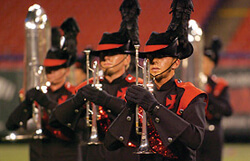 Drum corps in Texas will get their first glimpse of the 2007 Crossmen on June 15 as the San Antonio, Texas-based corps premieres its production, "Metamorphosis." The Crossmen "World Premiere" will be held at 7 p.m. at the state-of-the-art stadium at the Virgil T. Blossom Athletic Center in San Antonio. Family, friends, and drum corps fans from across Texas are invited to share in this special evening with the corps as they near the end of their four-week long spring training. As part of the festivities, a day-long educational band clinic will precede the evening exhibition performances for students interested in learning more about marching and music and to meet and interact with members of the corps. Visit YEA.org for registration information, event ticket prices and for additional information.